Enceladus Saturn's Rings - Solar System Planets And Moons Section. 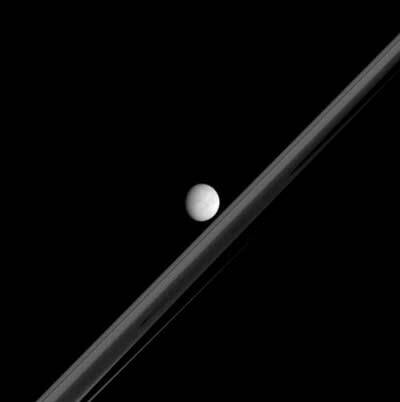 Enceladus is seen above Saturn's rings. NASA's Cassini spacecraft captured this beautiful image of Saturn's Moon Enceladus perched just above the giant planet's rings. Enceladus is 505 km (314 miles) across, and the photo was taken when Cassini was just below the ring plane. Saturn's A, B, and C rings are also visible in the photograph. This view is from less than one degree beneath the ring plane. If seen from directly beneath the rings, the planet's giant shadow would appear as an elongated half-ellipse; the acute viewing angle makes the shadow look more like a strip here. (See The Greatest Saturn Portrait...Yet, for a different viewing angle). The dark shadow first takes a bite out of the rings at the right, where the distant, outermost ring material appears to taper and fade.